I write this article in the Legia Warsaw Municipal Stadium, as I await the start of the Champions League first qualifying round second-leg game between the home side and Cork City. Legia’s traditional colours are green, white and red, like City, and they have similarly worn them in varying patterns over the years. Currently, they tend to favour all-white home kits with black trim, which is a pity considering their historically rich palette. I first became aware of them in April 1991, when I came home from school and watched them play Manchester United in the first leg of the European Cup Winners’ Cup semi-final, in the stadium that stood on this spot back then. That game, a 3-1 win for United which helped them to a 4-2 aggregate win, sticks in my mind as the first time I had seen a club goalkeeper wear an alternative shirt, with the late Les Sealey having to wear blue (albeit from the previous season) due to Legia having a green strip. I did notice that Legia had a big white square on their shirts, but I didn’t question why. Little did I realise the intriguing story behind it, and the fact that the Polish club were on to their third manufacturer of the season. They had mainly worn adidas during the 1980s, but the kits varied a lot – as was often the case with Eastern European sides – and in 1990-91 they used two adidas templates in green and white. However, in 1989-90, Legia had taken to the field in Umbro kit on occasion. The source of that? A transfer deal which saw Dariusz Wdowczyk and Dariusz Dziekanowski move to Celtic, with Legia asking that some kit be thrown in too. 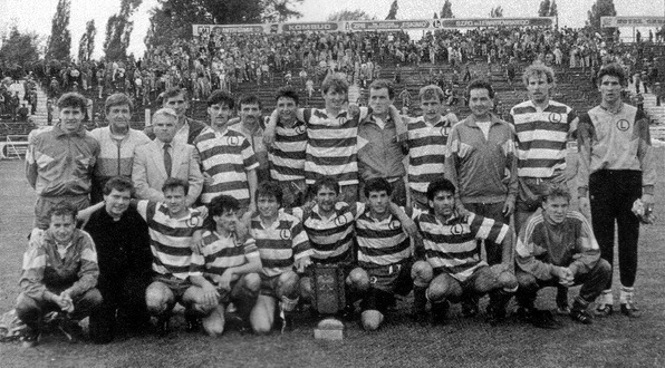 Celtic sent teamwear over – Legia won the 1990 Polish Cup final wearing what was essentially the 1988-90 Bhoys kit – and in 90-91 they wore a Feyenoord-like kit against Widzew Lodz (just to annoy their rivals, who are usually red and white) while there was also a green and yellow kit in the style used by Chelsea and Luton. Both were worn with adidas shorts. Back to the Cup Winners’ Cup. In beating Aberdeen in the last 16, Legia wore a white adidas strip, with the shorts featuring a large stripe, as there were problems in sourcing a green kit. Their progress in Europe had attracted the interest of various businessmen, and one of them, Andrzej Grajewski, offered to help broker a deal with Italian Lotto. He travelled to Italy with manager Stasiu Terlecki, though Terlecki didn’t have a valid passport at the time, so, in crossing the border back into Poland, he hid in the boot of the car, under the new kit. The new kit was worn in the Cup Winners’ Cup quarter-finals against Sampdoria, the template the same as that used by Costa Rica at the previous year’s World Cup – however, when Lotto looked for an image of the Legia crest to reproduce, they were given a pennant and they thought the whole pennant was the badge. Grajewski had pulled another stroke with the kits, asking Lotto to include the wordmark of Müllermilch, for whom he worked at the time. However, as Uefa hadn’t been informed in sufficient time about this development, Legia were threatened with a financial penalty unless the logo was covered. For the semi-final with United, a different Lotto style was used, feauring a kind of starburst emanating from Lotto logos, but again with the sponsor covered, meaning the effect was obscured. The Müllermilch logo was allowed to be used in league games, and, though Legia signed a ‘proper’ deal with adidas for 1991-92, the Lotto equipment was occasionally seen. Fascinating as always. Also a tiny coincidence in that Jacki Dziekanowski’s most famous game in Glasgow involved scoring four goals ahainst a Partizan Belgrade side wearing shorts borrowed from Celtic. And here is a photo of Legia (1995) wearing Adidas, the interesting part is that each goalie has a different Adidas style (as you presented them previously). Cheers Jimakos, that reminded me to write today’s post about Monaco!